The information that is taught and presented is the exact material that every Building Inspector, Building Department, Architect and Hoisting Engineer is trained on by the Dept. of Public Safety and the Massachusetts Board of Building Regulations and Standards (BBRS). Our instructors are licensed, certified and currently practice in construction, building code and legal matters. Real construction experience gained from the field... sets our trainers apart from the rest. Our trainers' experience and knowledge is a result of working in the industry for a variety of clients across New England. They bring this experience to every course we teach. You will no doubt receive excellent educational material and the most current information available on construction, building codes and heavy equipment. We are an approved educational provider for Massachusetts Construction Supervisors, Hoisting Engineers and Lead-Safe Renovation contractors. 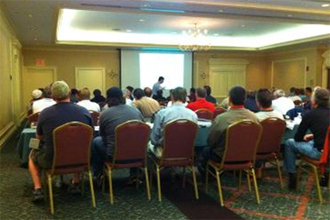 "Great presentation, very well presented and organized... one of the best seminars I've ever attended." "Glad to have a knowledgeable real world experienced instructor give the presentation." "Great review and insight on new and upcoming codes... business practices was very informative as well." "Convenient location, very comfortable setting, food was great"
"I have been to other continuing education classes in the past... it was like night and day. This class was significantly better!"